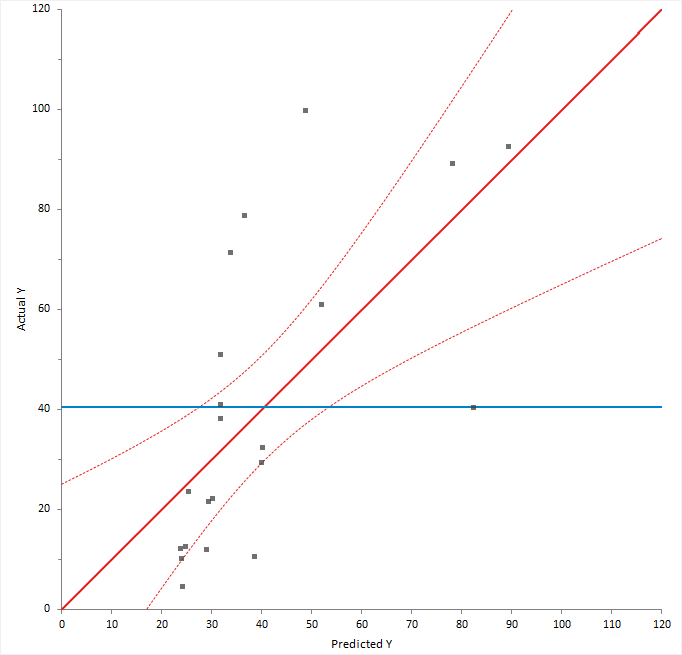 A predicted against actual plot shows the effect of the model and compares it against the null model. For a good fit, the points should be close to the fitted line, with narrow confidence bands. Points on the left or right of the plot, furthest from the mean, have the most leverage and effectively try to pull the fitted line toward the point. Points that are vertically distant from the line represent possible outliers. Both types of points can adversely affect the fit. The plot is also a visualization of the ANOVA table, except each observation is shown so you can gain much more insight than just the hypothesis test. The confidence interval around the full model line portrays the F-test that all the parameters except the intercept are zero. When the confidence interval does not include the horizontal null model line, the hypothesis test is significant.